He was lovely and made me feel so special and cared about and I cannot thank him enough for that. In the coffee lounge which was where you payed to be part of a few people to have coffee with Michael on his own he was clearly nervous. He explained how he often feels like this and how he usually sings songs when he is nervous like when he starts on a new job. He did take the chance to throw pens at the floor every time he name dropped which was so funny bless him. He went around the room and asked everyone their names and a fact about them and found it really funny that Lee had come to the con with me and that though a policeman I’m in charge lol. After the lounge he went for lunch with the other actors and it soon became clear he had been talking about everyone. When on stage with the other actors for the opening ceremony he saw me and lee and pointed us out what our names were which he remembered and that we were who he had been telling the others about! Kelly Hu said she thought it was brilliant that the woman was in charge and they all commented on my pink superman T-shirt! In the photo shoot with Michael I went up during the group session because as with most conventions Rogue wants people in wheelchairs to go in quickly so not to hold the queue up. Problem was that it meant telling the other actors that I didn’t want them in the photo with me which was pretty embarrassing! 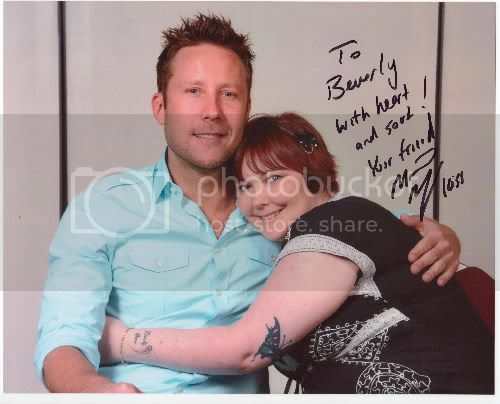 I gave Michael a cuddle which he said was lovely and I just love how the photo came out so much that I paid extra and got it signed! In the autograph session I gave Michael the presents I had bought for him, a book of politically incorrect jokes and a copy of the MS documentary Tasha made about me. He was really touched by the DVD and promised to write it before telling me about his friend’s mum who has MS as well and how I shouldn’t give up looking for a cure or trying treatments. He really inspired me and made me feel hopeful that things can change if I keep trying new treatments. He seemed surprised when I thanked him for his work and how it has got me through some badtimes with my depression. It meant a lot to me that I got a chance to thank him for this and I hope he understood how much he means to me. Sunday first thing was another coffee lounge with Michael I had paid for but with a 9am start and the actors coming all the way from central London things had to be pushed back. When the actors did arrive and the coffee lounge started Michael seemed a lot more relaxed, he was pleased to see people from the day before too. I must admit when he asked what we should all do my mischievous side kicked in and I suggested strip poker! To this he ripped open his shirt and gave me a flirty grin but soon started to do his shirt up again to which I asked why. Michael pointed at Lee and said “your husband is a cop and sitting right by me!” it made everyone laugh and broke the ice. Then Michael decided to give each of us nicknames and went round each of us making them up depending on our names and even quizzed us on one another’s before he would let us leave! he remembered! Then he went round the room and as people asked questions gave them nicknames too so funny! 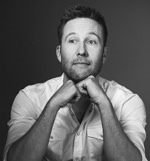 He and Kelly Hu were so funny together and it was great to see them interact because the other actors were quite shy in comparison. 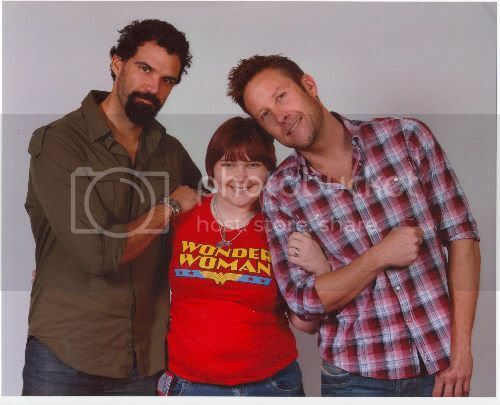 Next up was a photo shoot with Michael and Benjamin Ayres who both starred in Smallville, by this point my pain was quite bad and I was feeling very fatigued but I was determined to stand for my photo with them. I struggled to get out of my wheelchair so Michael came over and offered me his arm and walked me over to where they were doing the photos. Such a kind thing to do and meant so very much to me, he also laid his head against mine for the photo and I love the way it came out! He helped me back to my wheelchair too which again made me feel special and stopped me getting embarrassed because of how slow my walking was by this point. said he was really pleased with how it came out. I thanked him for making it such a special and enjoyable weekend for me and he thanked me for being so nice and said I was memorable! Lee shook his hand before we left and I told him to have a safe trip home. There are other things he said or did to me which I want to keep private but I want Michael to know that he was the reason I booked for this event and he made it so worth the pain and fatigue for that I will always be thankful.